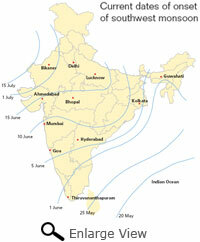 THE India Meteorological Department (IMD) is set to revise the dates of monsoon onset and withdrawal over the country. Between 1941 and 2000, there has been a shift in monsoon activity, with arrival and withdrawal delayed by seven to 10 days. Ajit Tyagi, director general of IMD in Delhi, made the announcement in the first week of October. It comes in wake of a report prepared by Tyagi and S D Attri, deputy director general meteorology (international) at IMD. It shows that maximum deviation from normal dates (average of dates of several years) was observed in the Andaman and Nicobar Islands, with showers arriving about seven to 11 days later than usual. The islands record the first monsoon rainfall in the country. IMD, however, maintains that this is a slight change. A B Mazumdar, deputy director general of IMD’s Pune branch, says the department recognises that the current set of dates needs to be updated. “IMD is collecting information about the onset and withdrawal dates over the past decade from stations all over the country. These will be verified against the report by Tyagi and Attri,” he says. After a careful analysis by experts, we will revise the dates, he adds. “But the changes are not likely to be significant.” IMD has not set a deadline for the analysis. The revision of dates could have an impact on crop planting and groundwater. 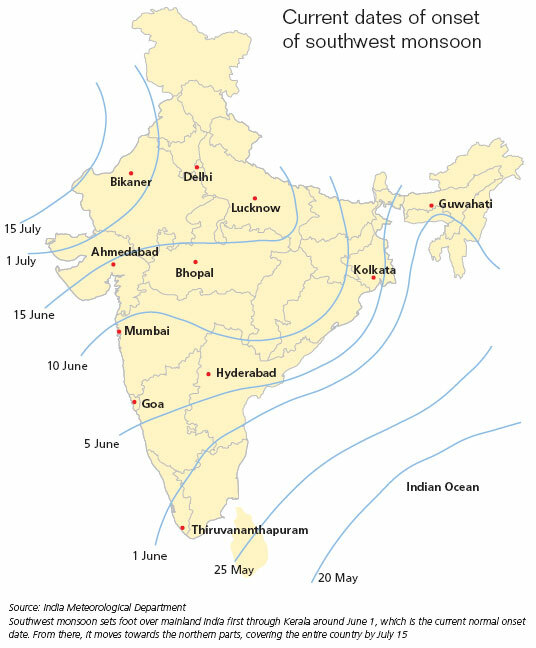 Gurdev Singh Hira, former additional director of research at Punjab Agricultural University, explains, “Officially, monsoon is supposed to arrive in Punjab around June 30. But farmers try to plant rice by mid-May and in the absence of rains they use groundwater. This leads to over extraction.” We have managed to push them to not plant the crop before June 20. If IMD delays the onset date, it will be difficult to convince the farmers to delay the sowing, he adds. Jayashree Sengupta, development economist at the Delhi-based think-tank Observer Research Foundation, says the change will have a major influence on agriculture only if there is a difference of more than two to three weeks. Vinay Sehgal, senior scientist at the Indian Agricultural Research Institute in Delhi, concurs. “Onset and withdrawal dates are climatic parameters of monsoon which have inherent variability,” he says. Onset and withdrawal dates vary every year and farmers adjust accordingly, he adds. The accuracy of monsoon prediction is an important factor, and this is where IMD needs to step up its efforts, Sengupta concludes.